In a city often called the “Kitchen of Japan,” one in which people spend the most money on food, it’s no wonder that Osaka is the foodie capital of the country. The best part about travelling here is that there is no lack of food options. Why don’t I introduce you to some of my favorite dishes, ones I think you must try? While Hiroshima still holds the upper hand in being the city that invented okonomyaki, Osaka has a flare of its own for this traditional Japanese pancake. The basic dish consists of a flour-based batter mixed with squid, prawn, octopus, and meat topped with dried bonito that waves back and forth as if alive, along with okonomiyaki sauce and mayonnaise. If you go to a special okonomyaki restaurant like Mizuno, you’ll be in for a treat — the food is prepared right in front of your eyes on tabletop hot plates. Takoyaki means “grilled octopus” in Japanese. Found on street corners all over the city, these are piping hot balls filled with octopus slices, pickled ginger, and green unions. These delicious snacks are even more fun when you can watch the cooks make them before your eyes on special takoyaki pans. Some places get creative and will smother the takoyaki with marinara sauce and cheese. Kitsune udon, found everywhere in Japan, originated in Osaka. 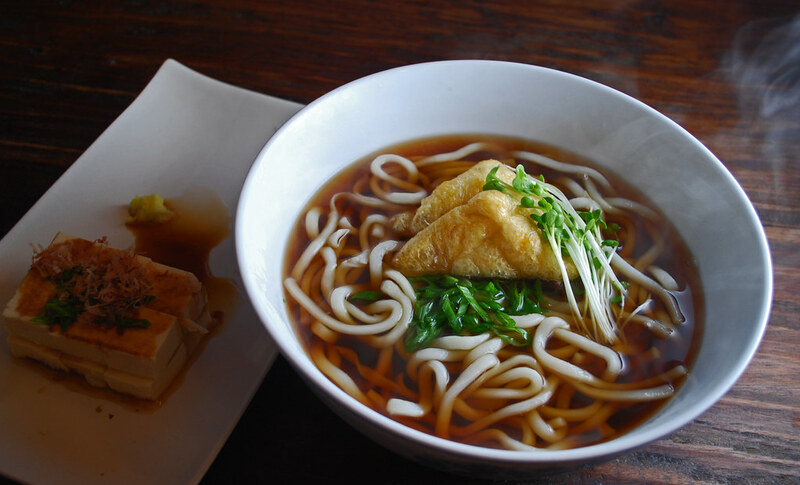 Served with udon noodles and pieces of sweet deep-fried tofu in a hot unami broth, kitsune udon is not the most complicated dish, but it’s the simplicity that often hits the spot. Osaka is also said to make the best udon in the world. Think of kushikatsu as a deep-fried kebab. 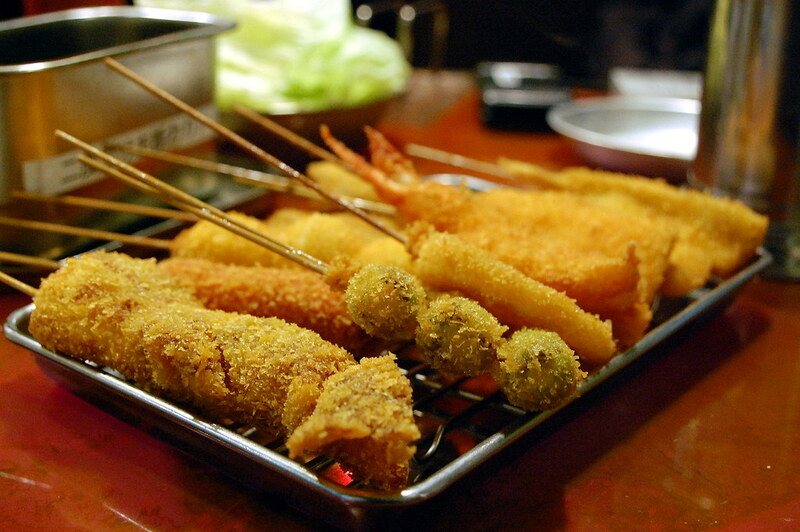 It consists of anything from pork, beef, chicken, or veggies breaded and then dunked in a deep fryer. Served hot, all you have to do is dip it in a communal tonkatsu sauce container and enjoy. The only thing you have to remember is that double dipping is not allowed. Kushikatsu is not the most healthy dish, but it is a mandatory part of the Osaka dining experience. Daruma is a popular kushikatsu restaurant in the city. You can find a branch in both Umeda and Nanba. While crab itself isn’t a special to Osaka, one of the most famous restaurants in the city is the one with the giant crab welcoming you inside. Situated right along the river, Kanidouraku Dotombori-Honten is a unique way to have crab prepared in what feels like an infinite number of ways. The restaurant is not cheap, however, so be prepared to spend a fair amount to fill your belly. Enjoy feasting in one of my favorite cities in Japan. You might gain a little weight but it is all worth it. If you’re looking for places to stay, make to find best deals on hotels in Osaka. Eating is mandatory in Osaka but so is a bed and a place to stay which is why I’ve put together 2 hotels that I recommend when planning a trip to the foodie capital of Japan. Brand new hotel opened in April 2017 and is located walking distance away from the Hommachi station. An uber modern property that’s only 2 km from Glico Man Sign. We had the opportunity to stay here in Osaka and was very impressed with this property. Super clean and spacious modern rooms. Communal private bathrooms. I’ve spent some time in Japan and there’s a lot more to share about the country. Don’t miss out these articles! While in Osaka we went to bakery in morning and had a delicious crisp flat “cookie”possibly made on a griddle.delicious! Never found anywhere else in the month travelling Japan. Any ideas what it is? Hey Lynn, was this a sweet “cookie”? Osaka is a fun, crazy and wild place but the food is amazing and all of those dishes are sooo good, love udon! It totally is Chanel! I hope you get to go some day soon. Japan is awesome right? Makes me hungry! I love the food in Japan – when you visit you are really struck by just how diverse it is, when most Japanese restaurants overseas just do the usual sushi/sashimi/tonkatsu/ramen combo. I particularly loved the okonomiyaki which we tried in Kyoto. Thanks for stopping by Marianne. I LOOOOOVe okonomiyaki. The best part is when they cook it fresh right in front of you. It’s also interesting to see how okonomiyaki itself varies from city to city based on their tastes and origins.